Humans are the only species that consume milk past infancy. And we don’t just consume it: We inhale it! We drink milk and we eat butter, cream, cheese and ice cream more now than ever before. In 2001, Americans consumed 30 pounds of cheese per person. That is eight times more than we consumed in 1909 and more than double consumption in 1975! While much of the cheese eaten in the early 1900s was made locally on a farm, today we are eating processed shredded cheeses out of plastic bags and we’re eating on the run: About 55% to 65% of the cheese we eat comes from commercially manufactured and prepared foods like packaged snack foods and fast food sandwiches. Being Dutch, I consider cheese to be one of my four primary foods; I don’t think I could live without it. And because of my background and my blood type, I can handle dairy products without any digestive concerns. But over the past few years, I have reduced my dairy intake significantly and made several changes to the dairy products I do consume. Most of us are simply consuming too much dairy; making some changes can go a long way toward improving our health. Whenever I talk about reducing dairy consumption, I always run into someone who grew up on a farm who argues that their parents lived long healthy lives drinking milk every day. And I don’t doubt that, because when I ask about it further, they always say their diet included one glass of milk with a meal and some butter and cheese, all made locally on their farm—which means they consumed raw, unpasteurized milk and milk products made freshly and untreated. In fact in 1909, 56% of all milk consumed was ingested on the farm where it was produced. By 2001, that number had dropped to 0.3%. While pasteurization is hailed as a great invention because it kills bacteria and prevents milk from souring, the heat process also kills off many beneficial nutrients. Named after Louis Pasteur, pasteurization was developed as a means of preserving beer and wine. Pasteur never applied it to milk; that came later, in the late 1800s, when dirty urban dairies were trying to find a way to produce cleaner milk. They discovered that pasteurization allowed them to still use the dirty milk, which was easier and cheaper than finding ways to make the milk cleaner. The idea quickly spread as profits grew. In order to market the new form of milk, producers had to convince consumers that unpasteurized milk was harmful. A smear campaign to link raw milk to diseases was undertaken and today, most people believe that raw milk is dangerous to consume. But the truth is that pasteurized milk poses far more health risks than raw milk. Raw milk contains healthy bacteria that actually inhibit the growth of harmful organisms; once removed, the pasteurized milk is actually more prone to contamination. In addition, the pasteurization process destroys many vital nutrients in the milk. Studies show up to a 66% loss of vitamins A, E and D and a 50% loss of vitamin C. Vitamins B6 and B12 are totally destroyed by the pasteurization process, as are many beneficial hormones, antibodies and enzymes. One enzyme destroyed in the process is lipase, which impairs fat metabolism and the ability to absorb fat-soluble vitamins such as A and D.
Pasteurization also makes calcium and other minerals less available. One way they test to see if the milk is appropriately pasteurized is to look for the destruction of phosphatase. If it’s absent, the milk is considered fully pasteurized. But phosphatase is essential for the absorption of calcium. So pasteurization makes calcium insoluble. It also destroys iodine, the lack of which can cause constipation. Pasteurization also turns the sugar of milk, lactose, into beta-lactose, which is more rapidly absorbed in the system and has been shown to make children hungrier sooner. But the dairy industry has formed a strong lobby to prevent the distribution and sale of raw milk in order to protect their profits. They’d rather have you believe it is harmful because if you found out the truth, you probably wouldn’t want to drink pasteurized milk. In addition to not being pasteurized, raw milk is produced on farms that also avoid some of the real dangers of milk and milk products today: hormones, pesticides and antibiotics. In the article on healthier meat choices, I discuss how hormones are used to help the animals to grow bigger. In addition to that injection process, some farms use an additional hormone called rBGH, which is a synthetic growth hormone. Back in the 1930s, a typical cow produced 12 pounds (or about a gallon and a half) of milk a day. By 1988, the average was 39 pounds a day. This was done primarily through selective breeding and using rBGH. Today a cow can now generate 50 pounds of milk a day. Cows injected with rBGH are 79% more likely to contract mastitis (an infection of the udder). Those cows also suffer from reproductive difficulties, digestive problems, an increased need for antibiotics and other abnormalities. Consumer’s Union reports that milk from rBGH treated cows is more likely to be of lower quality and contain more pus and bacteria than milk from untreated cows. But even if you find milk from farms that don’t use rBGH, other harmful hormones present in the cow remain. In addition to the ear pellet they receive as a calf containing synthetic hormones to help them grow, cows’ milk contains high amounts of estrogen because 75% to 90% of milk comes from pregnant cows. Milk from a late-stage pregnant cow can have up to 33 times as much estrone sulfate (a form of estrogen) and 10 times more progesterone. Much research ties excess estrogen to reproductive cancers such as prostate, testes, ovarian and breast cancer. Male breast enlargement has also been tied to high dairy and hormone-laden meat consumption. Test analysis has revealed traces of 80 different types of antibiotics in milk. Animal products like milk can also contain up to 14 times more pesticides than plants If you worry about pesticides in produce, you should be even more concerned about pesticides in meat and milk. For my family and myself, traditional milk, even organic, is simply not a good health choice. Raw milk not only avoids the hormone, antibiotic and pesticide challenges of modern milk production, it also offers the nutrients and enzymes that the pasteurization process destroys. Raw milk is a complete source of protein full of beneficial bacteria and vitamins, minerals and enzymes. 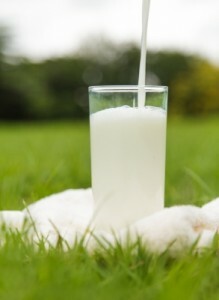 If you are going to consume cow’s milk, I suggest you do so sparingly and that you explore raw milk options. In some states, you can buy raw milk in stores such as Whole Foods. In most states, however, you’ll have to buy directly from the farm. And that may not be a viable option for some. When I moved from Maine to Massachusetts, I lost my easy access to raw milk. So I had to look for other options and another option to consider is goat’s milk. Much of the world consumes goat not cow’s milk, because it’s more widely available and also because most people can digest goat’s milk readily, even if they cannot tolerate cow’s milk. Goat’s milk is a great source of calcium and protein, phosphorus, riboflavin (vitamin B2), potassium and the amino acid tryptophan. It’s also been shown to enhance the metabolism of copper and iron. For those with milk allergy symptoms such as asthma, eczema, ear infections and rheumatoid arthritis, switching to goat milk may help alleviate symptoms. For those who can’t access or afford raw milk or goat milk, or who want a non-animal option, I recommend almond milk. Almond milk can be made inexpensively at home so it’s a great option if you want a fresh milk alternative that doesn’t cost a lot. I do not recommend soy milk, though it does contain some nutrients and protein, because it contains a natural chemical that mimics estrogen. These “fake” estrogens take up the hormone receptor sites intended for real estrogen, which leaves the excess estrogen unable to connect to a receptor site and left to wander around the body. Studies show excess estrogen can alter sexual development and can lead to reproductive concerns and cancers. Early puberty and male breast development are common side effects of excess estrogen. One study showed that two glasses of soy milk a day contained enough pseudo-estrogen to alter the timing of a woman’s reproductive cycle. As a result, I suggest everyone avoid soymilk. While I have focused predominantly on milk since it is the source for all dairy, cheese is a far bigger component of most people’s diets than milk. In general, we eat way too much cheese and cutting back on processed foods with cheese or hidden cheese in fast foods is a great step toward better health. When you do choose cheese, the same principles that we discussed above apply: Look for raw milk cheese (most markets carry some, especially raw milk bleu cheeses and they are delicious) and goat’s milk cheese, which are also prevalent and tasty. Experiment with these kinds of cheese and if you are a cheese lover like me, you’ll find some delicious new options in raw milk and goat’s milk cheeses. Occasionally, I do eat traditional cheese, but I buy it from Europe because the European Union has banned all hormones. When you buy a cheese from the mountainous Alps region of France or Switzerland, you are typically getting cheese made the traditional old-fashioned way from cows or goats who have roamed free in the sunshine, eating grass and living without pesticides, chemicals or drugs. So now that we have looked at milk and cheese options, how much, if any, dairy should you consume? Less is definitely more when it comes to dairy: For me, a little bit of raw milk or goat cheese makes my day and I try to eliminate eating cheese that is an afterthought rather than a primary focus in my meal. I believe in bioindividuality, which means I think that every body is different and your tolerance will depend on your own lifestyle factors and diet, as well as that of your ancestors. Some people can handle dairy without incident while others should cut it out completely. This may be due in part to the enzymes present in our blood. Dr. Peter D’Adamo argues in his blood type diet book, Eat Right for Your Type that blood type Bs (as I am) can handle dairy. Because ABs have some B in them, they can handle a little dairy as well. But type A should significantly reduce if not eliminate dairy and blood type O should completely avoid all dairy. This may or may not ring true for you, but if you are at all curious, I suggest eliminating dairy completely for two weeks, especially if you have any symptoms like headaches, IBS, sinuses, asthma or bloating/gas, and see how you feel during that time. (That includes all milk, cheese, yogurt, butter and ice cream.) Then reintroduce each slowly and see how you feel as you begin to eat them again: you’ll know right away if you can handle dairy and what types affect you more than others.